How about mechanism you can attach to a tripod, attach your camera to that mechanism, connect the whole thing to a PC and have a panorama or even a matrix (basically a panorama with multiple rows) taken automatically? Setup: Driven by small electric motor (5V?) over worm gears. PC controls motors with a cheap relay card. User interface for entering number of rows and columns and angle between two photos. Shutter release control either using "normal" camera control over USB or serial bus or by pressing the shutter release button with a third motor. This last version would be cool, because it would even allow automatic panoramas with analog or simple digital cameras. Or how about removing the LCD screen from the rear panel and build a scratch-built hinge mechanism for it? Your left hand goes around the handle, the right one around your camera. You can pivot the camera around the two axles and if the camera's nodal point is aligned with them, you will always 3D-swivel the camera around its nodal point, which helps in creating panoramas with as few seams as possible. The picture shows simplified renditions of axial ball bearings, but it probably would work with simple axial bushings, too. I designed this PanoramaAssistor with the modified base plate of my 2040IR "Monster" in mind, but with a little bit of adaptation, most any camera could fit. 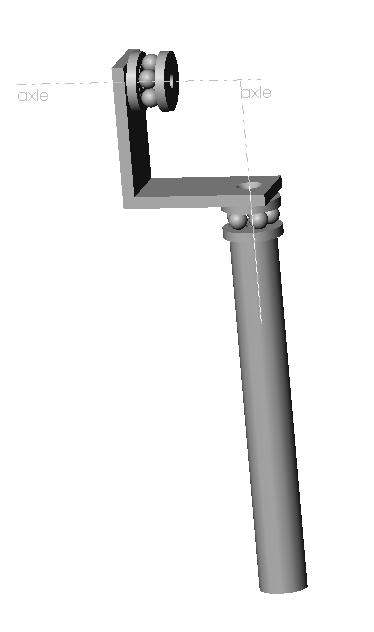 This swivelling mechanism could also be modified to be used on a tripod. However, I don't know of a really easy way to block the movement and enable it again like on professional tripods.